Elisabeth Foley and I have a long-standing blogging relationship. I can't really remember exactly when it began, because it began on her end. For a long time, she would be a faithful commenter on The Inkpen Authoress, and finally I began to reciprocate the favor on her blog, The Second Sentence. From there, she became an invaluable source of knowledge on independent publishing and mystery-writing, which is why she is now The One on whom I am going to rely much while editing and polishing Anon, Sir, Anon. 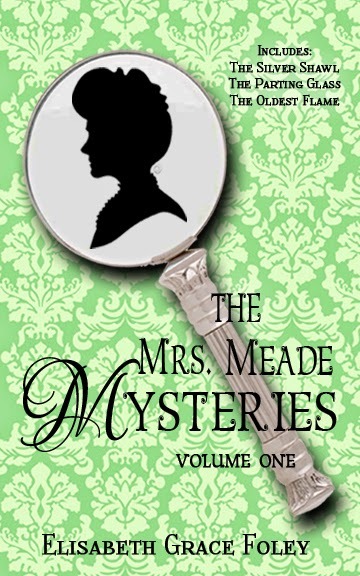 Elisabeth has released three of her Mrs. Meade Mysteries as e-books and now we non-Kindle-ers (that is a word of my own fabrication) have the chance to own all three in one lovely paperback volume! Meet Mrs. Meade, a gentle but shrewd widow lady with keen insight into human nature and a knack for solving mysteries. Problems both quaint and dramatic find her in Sour Springs, a small town in Colorado at the turn of the twentieth century. Here in Volume One are her first three adventures, novelette-length mysteries previously published individually. In The Silver Shawl, a young woman has disappeared from the boarding-house where she lives—was she kidnapped, or did she have a reason to flee? In The Parting Glass, Mrs. Meade puzzles over the case of a respectable young man accused of drunkenly assaulting a woman. And in The Oldest Flame, Mrs. Meade’s visit with old friends turns to disaster with a house fire that may have been deliberately set. Quick and entertaining forays into mystery and times past, each story is just the perfect length to accompany a cup of tea or coffee for a cozy afternoon. You can purchase said paperback version from Amazon and Createspace! Before I began writing mysteries, I read mysteries. I started very early with the Boxcar Children series—all nineteen of the original books. From there I progressed to Nancy Drew, then Sherlock Holmes, and really made the break into classic mystery when I read Agatha Christie’s Murder on the Orient Express. Though, as you can see, I’m very fond of the acknowledged classics, I’ve also found great pleasure in stumbling upon some rare or obscure mysteries which turned out to be hidden gems. So here, for your enjoyment, is a list of my favorites in this category. Some of them are chiefly remarkable for their unique setting or style, but many are fantastic mysteries in their own right. A couple of them have made scholarly lists of the greatest mysteries, but they seem to be much lesser-known in a popular sense. I know I’d never heard of any of them before I stumbled across them in the last year or two. Have you? This 1927 mystery novel is just brilliantly constructed. Told from the perspective of two young reporters, a girl and a man, covering a sensational murder trial, the whole book takes place in and around the courtroom. The case is gradually unfolded, layer by layer, through the interrogation of witnesses and presentation of new evidence. You won’t be able to put it down once you start! This collection of short stories has been compared to Chesterton’s Father Brown mysteries, and I think the comparison is apt, even though on the surface the detectives are polar opposites: Father Brown is a small, mild, English Catholic priest; Uncle Abner a big, stalwart American Protestant, a landowner in rural Virginia of the early 1800s. Yet as in Chesterton, Abner's Christian faith is at the root of his strong belief in justice, which drives him to find the correct solutions to crimes. Post’s writing is just beautiful, and the stories gripping and unique. Highly recommended. I was tickled to discover that Brand, known as the king of Western pulp magazine writers, had actually written a locked-room murder mystery set in the West—in a ruined hacienda complete with ghostly legend, with a half-dozen likely suspects and a shrewd sheriff for detective (whom the narrator both aids and tries to mislead). Those not familiar with Brand might take some time getting used to his style (the book originated as a magazine serial, which might account for the plot veering off in different directions now and then), but it’s a very creditable attempt at a whodunit for a non-mystery author, with the Western setting making it fun. Hilton, best known as the author of such novels as Random Harvest, Lost Horizon and Goodbye, Mr. Chips, took a stab at writing a detective novel too—his only mystery, I believe, published under a pseudonym. It takes place in a setting that Hilton and readers of Mr. Chips would know well: a boys’ boarding-school. After two students, brothers, perish in suspicious “accidents,” leaving an inheritance to one of the faculty, an amateur-detective alumni steps in to investigate. Experienced mystery-readers might guess at the solution, but it’s a charmingly written take on the classic English murder mystery. This collection of loosely connected short stories has a clever premise: Violet Strange, a wealthy young woman of Edwardian high society, secretly assists a professional detective with delicate cases—investigating where class barriers prevent a detective from going, or in cases involving only women, where a man cannot go. There’s also the lingering question all through the stories, which is resolved in the final one: Why does a high-class, wealthy young woman need to earn money by doing detective work in secret? Just when I thought I was running out of old-time mysteries to read, I discovered this collection. These short mysteries (about the length of my own Mrs. Meade adventures) were originally written in German. Joe Müller is a member of the Imperial Austrian Police, an unassuming and diffident man but a brilliant detective. The characters and mystery plots are very well done, and the setting of pre-WWI Vienna hooked me from the first paragraph. But wait, what am I doing? If you go and read all of these, when will you ever have time to read the Mrs. Meade Mysteries? Ah, but that’s the thing about mystery readers—we can never get enough. I’ve read through the complete Sherlock Holmes and Father Brown and almost everything Agatha Christie wrote, and I’m still as eagerly on the lookout as ever for another good mystery. If you’re anything like me, I’m sure you feel the same way. A mystery by A.A. Milne?? I'm going to put that on order at the library! All of these (including your own) sound fascinating! My grandma owns The Red House Mystery. Every time I'm at her house I think about starting it... but since we're usually there a max of three or four days, I know I wouldn't get through it. Maybe she'd let me borrow it! Thanks for the great list. 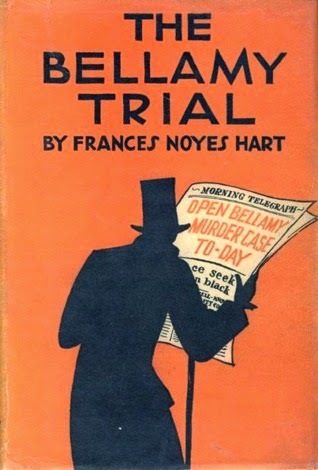 The Bellamy Trial especially shall go on my list of to-reads, I think. Ooooooh! I love mysteries! And those all sound so good... I haven't read any of them. I haven't even heard of these Father Brown mysteries... And THAT is supposed to be the more well known one! BUT I have read Christie and Doyle, so there. And all the Nancy Drews. I loved those as a kid! I might have guessed that the Milne mystery would be popular around here! :) I should also mention that for anyone who has an e-reader, you can find Uncle Abner, The Golden Slipper, The Red House Mystery and Joe Müller for free or nearly-free in the Kindle Store or at Project Gutenberg (the Joe Müller collection is 99¢ on Kindle and the individual stories are free at PG). The only one not available on Kindle at all is The Bellamy Trial. 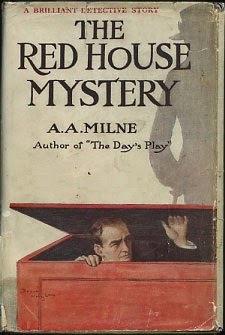 I have heard much of The Red House Mystery, so I better read A. A. Milne and stop making myself look ignorant ;). Also, I love Agatha Christie’s Murder on the Orient Express!